Aster flowers (Asteraceae) is a flowering perennial native to Asia, Europe and North America. The star-shaped flowers are what give this plant its name. Asters are relatively low-maintenance plants that have good tolerance to both heat and cold in USDA Hardiness Zones 3a to 9b. Asters will resume their growth cycle if properly maintained over winter. 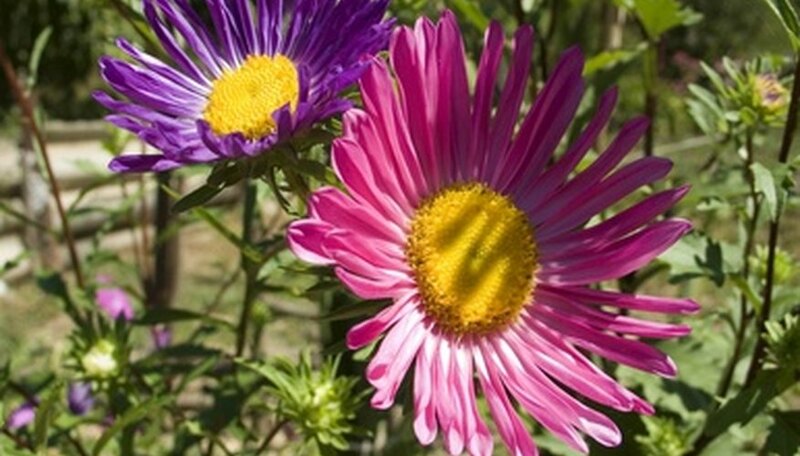 Water the soil to a depth of at least 2 inches to give asters added moisture at the end of autumn. Make sure to do this before the first frost of winter so the water has time to get into the soil before the ground freezes. Allow the asters to remain standing through the winter. This gives the asters a stronger ability to survive winter weather. It also allows the birds to collect the seeds from the flowers and keep the growing cycle going. Apply fertilizer at the base of the plants before and after winter; fertlize again during the middle of the year to sustain good plant growth and blossoms. Place a 2-inch layer of mulch or compost over the ground where the asters are in late autumn. Make sure the mulch is spread out evenly. This will both keep the frost out and maintain proper moisture content for the flowers during the winter. Too much water is the principal killer of aster flowers during winter. Make sure the soil is well-draining before applying the mulch. Cut off spent blooms with clean shears. Cut any damaged or diseased foliage immediatly when found. Remove mulch in the spring after the threat of frost has passed. Cut down the plants to the soil. Allow the plants to begin the new growing season with fresh shoots.